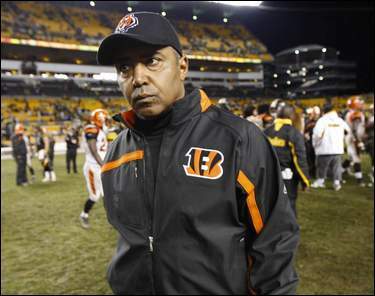 Cincinnati Bengals head coach Marvin Lewis was not on Steve Pederson’s shortlist of candidates during the first go around but with Pitt now in a nightmare situation after the firing of Mike Haywood who was arrested on Friday, is Lewis now on Pederson’s list? Michael Lombardi of the NFLnetwork, reported this afternoon that Lewis is infact on Pitt’s shortlist. This has not been confirmed anywhere else but Lombardi is a former NFL executive who is very well connected around the league. Lewis finished 4-12 with Cincinnati this season and today was asked about whether he’s thought about coaching at Pitt. “No I haven’t, ” Lewis said. Lewis then declined comment when reporters asked if he’s thought about coaching in the college ranks. “I can’t comment on that, ” Lewis said. Lewis is expected to learn his fate in Cincinnati by Tuesday of this week. He is said to have some interest in returning to Cincinnati but there’s been a lot of mixed signals on that front as Lewis wants to see changes in Cincinnati but he said today it has nothing to do with the money. As expected, Lewis would barely touch the Pitt speculation but he’s believed to have interest in the job, if Pitt comes calling.